Hedge funds are not perfect. They have their bad picks just like everyone else. Facebook, a stock hedge funds have loved, lost a third of its value since the end of July. Although hedge funds are not perfect, their consensus picks do deliver solid returns, however. Our data show the top 30 S&P 500 stocks among hedge funds at the end of September 2018 yielded an average return of 6.7% year-to-date, vs. a gain of 2.6% for the S&P 500 Index. Because hedge funds have a lot of resources and their consensus picks do well, we pay attention to what they think. In this article, we analyze what the elite funds think of CBRE Group, Inc. (NYSE:CBRE). Hedge fund ownership of CBRE Group, Inc. (NYSE:CBRE) rebounded in Q3 after experiencing a decrease in Q2 for the first time in over a year. 29 hedge funds in our database were long CBRE on September 30, up from 24 on June 30. While Trapeze Asset Management is not one of those funds tracked by our system, it’s also bullish on CBRE, as evidenced by Trapeze Asset Management’s Q3 Investor Letter. Among other things, the fund stated that CBRE looks attractive based on the fund’s FMV estimate of $55 for the stock (shares currently trade at less than $43). At Q3’s end, a total of 29 of the hedge funds tracked by Insider Monkey held long positions in this stock, a 21% increase from the previous quarter. 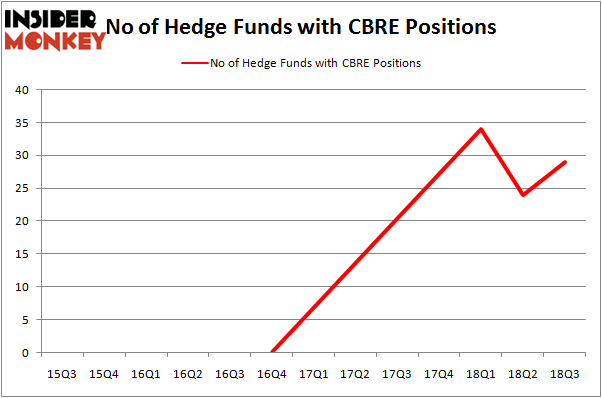 The graph below displays the number of hedge funds with bullish position in CBRE over the last 13 quarters. With hedgies’ sentiment swirling, there exists an “upper tier” of notable hedge fund managers who were boosting their stakes considerably (or already accumulated large positions). Among these funds, ValueAct Capital held the most valuable stake in CBRE Group, Inc. (NYSE:CBRE), which was worth $878.3 million at the end of the third quarter. On the second spot was Cantillon Capital Management which amassed $311.6 million worth of shares. Moreover, Cantillon Capital Management, Eminence Capital, and Ariel Investments were also bullish on CBRE Group, Inc. (NYSE:CBRE), allocating a large percentage of their portfolios to this stock. Now, some big names were breaking ground themselves. McKinley Capital Management, managed by Robert B. Gillam, assembled the largest position in CBRE Group, Inc. (NYSE:CBRE). McKinley Capital Management had $11.7 million invested in the company at the end of the quarter. Anand Parekh’s Alyeska Investment Group also initiated a $11 million position during the quarter. The other funds with new positions in the stock are Matthew Tewksbury’s Stevens Capital Management, George Hall’s Clinton Group, and Mike Vranos’ Ellington. 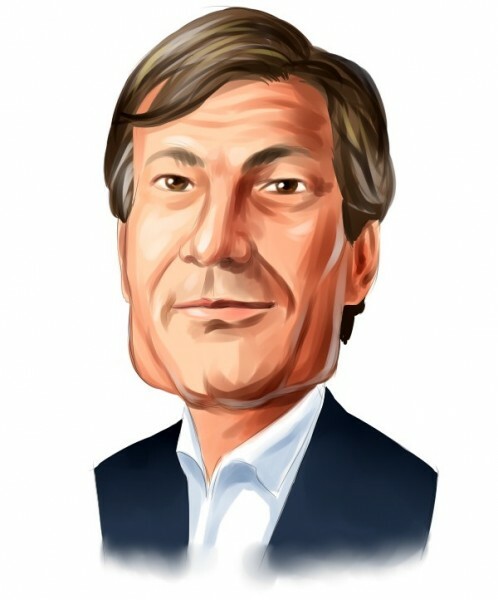 Let’s go over hedge fund activity in other stocks – not necessarily in the same industry as CBRE Group, Inc. (NYSE:CBRE) but similarly valued. We will take a look at Evergy, Inc. (NYSE:EVRG), Restaurant Brands International Inc (NYSE:QSR), Avangrid, Inc. (NYSE:AGR), and Quest Diagnostics Incorporated (NYSE:DGX). This group of stocks’ market values are similar to CBRE’s market value. As you can see these stocks had an average of 30 hedge funds with bullish positions and the average amount invested in these stocks was $1.59 billion. That figure was $1.78 billion in CBRE’s case. Restaurant Brands International Inc (NYSE:QSR) is the most popular stock in this table. On the other hand Avangrid, Inc. (NYSE:AGR) is the least popular one with only 18 bullish hedge fund positions. CBRE Group, Inc. (NYSE:CBRE) is not the least popular stock in this group but hedge fund interest is still below average. This is a slightly negative signal and we’d rather spend our time researching stocks that hedge funds are piling on, like DGX. Hedge Funds Are Underwhelmed by Sanofi (SNY)’s Growth Prospects Is It Time to Follow Hedge Funds Into BP p.l.c. (BP)? Hedge Funds Are Dumping C.H. Robinson Worldwide, Inc. (NASDAQ:CHRW) Is Ulta Beauty, Inc. (NASDAQ:ULTA) A Good Stock To Buy? Billionaire Ken Fisher is Betting Big on this Japanese Banking Giant Is Old Dominion Freight Line, Inc. (NASDAQ:ODFL) A Good Stock To Buy?